Throughout the state solicitations seeking donations of used cars can appear in newspapers, billboards, and elsewhere. Not all of those solicitations are from worthy charities, and some may not be from charities at all. By taking a few precautions, you can ensure that your vehicle donation will serve a worthy charitable purpose and provide you with a legitimate tax deduction. 1. Search the Attorney General's Charities Bureau Registry at www.charitiesnys.com to see if the charity is properly registered and has filed its financial reports with the Attorney General. 1. Find out what the charity will do with your car. Will it be given to a needy individual or sold? Try to find a charity that will actually use your car in its programs or give it to a needy individual. If the car will be sold, find out exactly how much of the sale price will actually be kept by the charity. Be wary of claims such as "all proceeds will go to charity." 2. Find out what the charity does with its money. Contact the charity and confirm that your donation will be used for the purposes stated by the telemarketer. Review the charity's financial reports to see how much of its money is used for charitable programs and how much is used for administrative costs. Financial reports of charities are available on the Attorney General's Web site at www.charitiesnys.com. 3. Make sure that you are actually giving your car to a charity. Some car donation programs are conducted by for-profit towing companies or used car dealers who claim to pick up cars on behalf of a charity when there is little or no charitable benefit. Do not donate your car if you cannot confirm that your contribution will go to a charity. 4. If you respond to a billboard sign or advertisement, or receive a telephone call asking you to donate a car to a charity, you may be speaking with a paid professional fundraiser and not the charity. Many professional fundraisers receive most of the money they raise. Ask how much the fundraiser is being paid and how much is going to charity. Contact the Charities Bureau at charities.fundraising@ag.ny.gov to find out if the fundraiser is registered with the Charities Bureau - professional fundraisers are required to be registered and to file financial reports with the Attorney General's Charities Bureau. 1. Don't be pressured by emotional ads or pressure to donate - take your time in identifying a charity that will make good use of your contribution. Any worthy charity will be happy to give you sufficient time to make your decision. 2. Be wary of offers that seem too good to be true. Some car donation programs offer vacation trips and large gift certificates in exchange for the donation of a car. If it sounds too good to be true, it probably is. Is it realistic to expect that you will be given a vacation trip or a $1000 gift certificate in exchange for your klunker? Be aware that if you receive something in exchange for your contribution, you may not be entitled to a tax deduction. 2. Make sure you get a receipt for your donation - the charity is required to give you a receipt, and you will need it in order to claim a tax deduction. 3. Consult the IRS publication "Determining the Value of Donated Property" posted at http://www.irs.gov/publications/p561/index.html - when setting the value of your donated car. 4. Complete forms required by the IRS, including Form 8283 - posted at http://www.irs.gov/pub/irs-pdf/f8283.pdf - which may need to be attached to your tax return depending on the amount of the deduction you are claiming. Make sure to transfer the title of your donated car. Some organizations soliciting cars will ask you to leave blank the assignment of ownership line on the car's title papers to make the process simpler for them. However, if the title of your car is not transferred, you may find yourself liable for parking tickets, or worse, responsibility if the car is in an accident. Keep a copy of the transfer papers for your records. If you do not have a copy of the title papers, contact the New York State Department of Motor Vehicles (DMV) - http://www.dmv.ny.gov/index.htm - to find out how to get a replacement. Remember to remove your license plates and surrender them to the DMV or transfer them to another car. Do not leave them on the donated car. Consult the DMV at http://www.dmv.ny.gov/regtransfer.htm for information concerning removal, transfer and surrender of plates. How do I find out if a charity is registered with the Attorney General's Charities Bureau Registry? You can find out if a charity is registered by checking the Attorney General's searchable registry on line at www.charitiesnys.com or by sending an email to charities.bureau@ag.ny.gov. Some organizations may be exempt from registration. 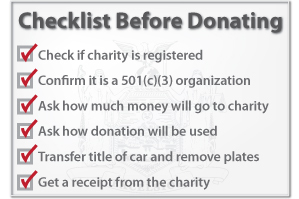 To determine if an organization is exempt, send an email to charities.bureau@ag.ny.gov. How do I know what the charity will do with my car? Some charities sell the cars they receive either at auctions or to junk yards as scrap. Others use them for their programs or give them to needy people. Before donating your car, you should ask how your car will be used and, if it will be sold, how much the charity will receive. Does the charity have to give me a receipt? Charities must give you a receipt if the value of your car is over $250. Make sure to ask for - and receive - a receipt no matter how much your car is worth. Be aware that the IRS may require other forms, depending on the value of your car. Information concerning IRS requirements is posted at www.irs.gov. Do I need to transfer title of my car to the charity? Yes. Make sure that you fill out the assignment of ownership line on the car's title papers to make sure that ownership of the car is transferred. If you do not have a copy of the title papers, contact the New York State Department of Motor Vehicles - http://www.dmv.ny.gov/index.htm - to find out how to get a replacement. What should I do with my license plates when I donate my car? You should remove your license plates when donating your car. If they remain on the car, you may be responsible for parking tickets and other violations of law. Consult the New York State Department of Motor Vehicles at http://www.dmv.ny.gov/regtransfer.htm for information concerning removal, transfer and surrender of plates. What should I do if a towing company asks me to donate my car? Many charities have arrangements with for-profit towing companies that advertise that donated cars will benefit a charity. Often, the towing company pays the charity a fixed amount, sometimes very little, to the charity, regardless of the value of the car. Before donating your car to such companies, find out how much the charity will get from your donation. Better yet, find a charity that will accept your donation directly.